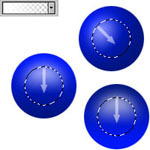 First choose the Elliptical Marquee Tool by either clicking on it in the Toolbar or hitting Shift+M twice. 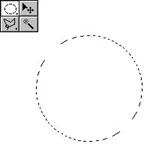 Now try to create a circular selection. After you've failed, hold down Shift while trying and you'll get a very nice very round selection. Choose two shades of the color your finished sphere should be (255,0,0 and 128,0,0 works fine for a red one). Now you must decide what kind of sphere you want to create. Use the Gradient-Tool to fill your selection with some color. You could use the Linear Gradient from top to bottom or from bottom to top. This way, we create nice spheres with light from an uncertain direction. 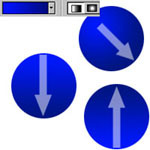 The other possibility is to use the Radial Gradient from top left to the bottom right. This direction is kinda natural for light, so it works best for the Radial Gradient. Follow the arrows on the left if you're confused. Not pretty spherish, yet? Well, we're just in the middle of this tutorial, so there's no need to give up this early. Since there are some highlights missing, we'll do the following: With the sphere still selected, create a new layer (Ctrl+Shift+N or click the "New Layer"-Button) and contract the selection a bit by using Select -> Modify -> Contract. After this, feather the selection by using Select -> Feather or pressing Ctrl+Alt+D. I used 16 for Contract and 8 for Feather for mine on the left, but for other spheresizes other values will be better. Choose white as your foreground-color and add a color-to-transparency-gradient (either linear or radial). Have a look at the arrows again, confused-one. This done, lower the opacity of that layer to about 80% to make the white splashes look like some reflection or something. That was it. 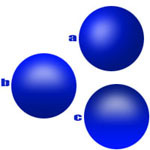 With the simple use of different gradients you are now able to create balls (a), solid plastic spheres (b) and even glossy spheres (c). Never underestimate the usefulness of gradients.